As you may be aware, Callie Santora, our office manager and weekly Shepherd’s Voice editor and publisher, will be away the week of March 27-31 to visit family in Eastern Washington, so we are doing a special double issue this week covering the next two Sundays, March 26 and April 2, the last two stops on our Lenten journey toward the decisive events of Holy Week. And please note the calendars with the lay ministry assignments on them. Lectors, tech, ushers, fellowship servers, and acolytes are all vitally important to our life together as a church family. If you see places where you could sign up to help please do so. So our Lenten journey is drawing to its terrible and yet wonderful conclusion now. The last two stops on that journey are really quite astounding, and they invite us to deep spiritual reflection. This Sunday, the 4th Sunday in Lent, the Gospel to be read is the story of the man born blind in John 9. Are we not all spiritually blind at times? Do we not all fail to see the goodness of God as the blind man saw? With delightful irony John shows us how a man born blind can see far better than some who has the use of two good eyes. The following Sunday, April 2, is the 5th and last Sunday in Lent. 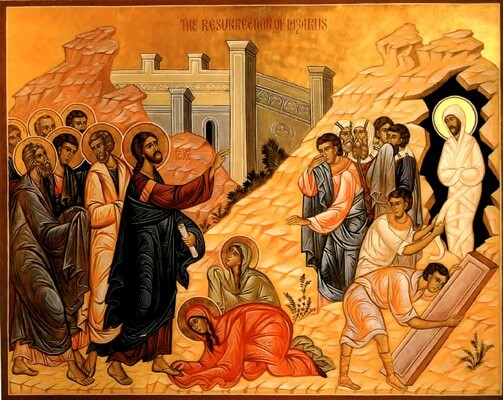 The Gospel for that Sunday is the story of the raising of Lazarus from John 11. 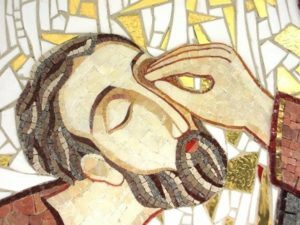 Lazarus and his sisters Mary and Martha were among Jesus’ close friends. They lived in Bethany not far from Jerusalem. Not to be missed in this a story is the love of Jesus for his friend Lazarus who has died. It is here that we read the shortest verse in the Bible: “Jesus wept” (John 11:35). In spite of the fact that Jesus restores Lazarus to life, John 11 ends on an ominous note. Outraged at Jesus’ growing popularity, and indeed his divine power over death itself, the religious establishment declares its intention to kill Jesus, which foreshadows Jesus’ passion and death in the week to follow. This time of the year our language is especially important. We need to be aware of how our words may be heard by others. For example, in John’s Gospel, and in the New Testament generally, the members of the opposition that Jesus encounters is often called simply “the Jews.” In today’s world that kind of language can be heard as anti-Semitic, as prejudice against Jewish people in general. Sadly Christians of the past hatefully and wrongly condemned “Jews” as a race of people for “murdering Jesus.” Certainly Martin Luther himself often seems quite hateful toward the Jewish people in some of his writings, as he also expresses hateful words towards Roman Catholics, Calvinists, and the followers of Ulrich Zwingli, and everyone else who disagreed with him. Simply put Luther was NOT a very tolerant person. No one can deny Luther’s important contributions to the reform of the church, which was very much needed. But we should understand he was still a man of his times, and he was a sinner just like you and me. He got some things terribly wrong. Our church does not claim divine inspiration for Luther’s writings. We also have the terrible evidence of the Holocaust. Many members of Christian churches, including Lutherans, stood by and did nothing while Jewish people and other non-conforming minorities were carted off to slave labor and extermination in concentration camps by the Nazi regime. The Nazi Holocaust is a terrible but important reminder of what happens when hate and racism go unchecked by laws that protect human rights. For these historic and many other reasons it is very important for Christians today to be cautious about intolerance, racism, prejudice and hatred in thought, speech or action. They can easily creep into our conversations. That’s especially true when it comes to the decisive events of Holy Week. Alas my treason, Jesus, hath undone Thee. God give us a blessed closure to our Lenten journey over the next two Sundays, and bring us to a new awareness of the terrible wonder of God’s mercy for sinners during Holy Week that we may be prepared with joy to celebrate the Festival of the Resurrection of our Lord on Easter Sunday.